It’s that time of year again, when I finally start writing about the trip plan for the summer. Every winter I plot and obsess about where we’ll go in the summer, because (a) planning is a way to get through the boring parts of the winter; (b) summer is our big opportunity to go places, since we are “forced” to travel east for Alumapalooza anyway. This year’s plan is especially exciting to us. Late next week we’ll hit the road toward Alumapalooza. This is a long slog, something north of 2,000 miles to Ohio, and lots of tedious Interstate travel, but we try to mix it up a little each year with new stops or routes. After doing this trip from Tucson at least five? six? times, I think we’ve exhausted every possible route so now we are going a little off the concrete path and adding unnecessary miles just to see something new. The big goal for this leg is the Great Smokies National Park (“B” on the map). We have never visited with the Airstream, and yet it’s reputedly the most visited National Park in the entire NPS system. Eleanor and I went once, back in the 1990s, pre-child, pre-Airstream, and we didn’t get a chance to do any hiking, so this visit will probably be entirely different. Should be a nice chance to chill out before we jump into the long days of running Alumapalooza. To get there on our schedule, we must bear up to once again traversing the I-10 and I-20 route through Texas. It’s not the most exciting drive, but I prefer it slightly to I-40 through Oklahoma, or I-70 through Kansas, or I-80 through Nebraska. No matter which way you cross the Plains, you are going to see a lot of flatness and emptiness, so all you can do is pick the type of emptiness you prefer. I like the kind with more desert in it than grass. In Ohio we’ll be running Alumapalooza for a week (including prep time). After that, and a mandatory decompression session with Airstream friends in eastern Ohio, we’ll head east along a well-trodden path of I-90 with only one or two quick stops in New York. Why the rush? Well, there are only ten days between Alumapalooza and our next major travel leg, and in that short time I’ve got to tow the Airstream 800 miles and catch up/get ahead on work. 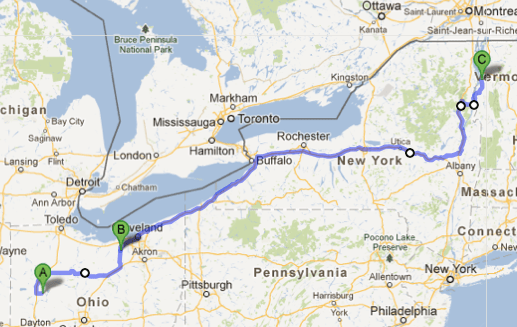 I also have a quick overnight motorcycle tour to Americade planned with my brother and some of his friends. It’s a lot to pack into a short time. A few days later, Eleanor and I will head to New York City to catch a plan to Germany. Eleanor and I are going to camp with the European Airstreamers at their annual gathering, just north of Frankfurt. We’ll be staying for three nights in a new Euro-spec Airstream provided courtesy of Roka Werk AG, the German Airstream dealership. Very cool, and I can’t wait. Of course, I have to sing for my supper; in this case, doing a presentation about “America’s National Parks” for the assembled Europeans. In the process of researching it I was amazed at what I didn’t know about the National Parks. We’ve visited close to 200 of them now (Emma has over 60 Junior Ranger badges) and still there’s so much more to see and learn. I’ve spent several nights picking out the best photos we have for the slide show, which has brought back a lot of great memories. After the 3-day Gathering, we’re going to plan hookey for a while, touring around Europe in a rental car. What will we do? I’m not sure, but don’t expect me to return calls for a while. I’m not even bringing my laptop, just an iPad. It will be a wonderful opportunity to disconnect. Then it’s back to Vermont for a week or so with family, and then I’ll fly back to Tucson for July, reverting into my alter-ego personality of Temporary Bachelor Man for four weeks. I can’t tell you what to expect from that either. You never know what TBM will do. Probably he’ll be buried in work from all the time I was offline in June, but I’m certain he’ll do his best to make a small roadtrip in the time available. In August I’m flying up to Oregon to run Alumafandango. Being the first time in that location, it should be a lot of fun with a lot of new faces. We’re going to release the Preliminary Event Program in June (most likely), and it will be typically packed with stuff to do all day. The setting up there in Canyonville is just beautiful, too. Mid-August? I dunno. Probably a little more TBM, then flying to Vermont to retrieve the family (remember them?) and the Airstream. After that we are kind of open on the plan, including the return timing. We might leave in August and take a long trip across the northern tier before heading home, or we might hang in New England until early September and then bolt home (out of necessity due to appointments). In prior years our annual round-robin has run anywhere from 8,000 to 14,000 miles total (including side trips not towing). I’m expecting about the same this year. Fuel prices are about the same as last year so I don’t expect a major change in the budget. We’ll spend the same amount for the Airstream portion of the trip as we would have taking the family on a two week cruise. Not cheap, but to my mind a bargain for an entire summer of fun.